Washington's Game 6 win was exhilarating, but gave way to a Game 7 that once again exposed the Wizards' fundamental flaws. WASHINGTON — There was a prevailing opinion nationally that Game 7 between the Washington Wizards and Boston Celtics didn’t matter in the big picture, that the Cavaliers were the preordained champs of the East. But given the regular season matchups with Cleveland, the epic overtime game in Washington and the 12-point revenge win on the road, there was at least hope that the Wizards might put a scare into the defending champs. With a win Monday night, they would have the opportunity to play the most relevant playoff series for the franchise in decades. So it still mattered, at least around these parts. And the way this series has gone, Game 7 was always going to be a battle. But the way it unfolded, with Game 3 antagonist Kelly Olynyk emerging as the unlikeliest of playoff heroes to put the game on ice, was especially painful. Olynyk’s hard screen on Kelly Oubre Jr. — who responded by charging and decking him, earning a one-game suspension, added additional spark to a series between two teams that already didn’t like each other. But where Oubre’s display of passion may have helped (a questionable proposition), his play certainly didn’t benefit. Following his Game 4 suspension, the Wizards were seven points worse during Oubre’s 20 minutes on the floor in Game 5. He played just seven scoreless minutes in Game 6. And he only saw the floor for the final six seconds of garbage time Monday night. Oubre’s struggles were a microcosm of what ailed Washington all series, and really, all season long — lack of reliable depth outside the starting five. Offseason free agent pickup Ian Mahinmi returned from injury in Game 3 and posted a plus-minus of -37 the rest of the way. Trade deadline acquisition Bojan Bogdanovic was -50 in the series. Head coach Scott Brooks never could quite harness the right combinations of players to keep the Celtics from erasing the good work being put in by the starting five. As the game dragged on and minutes piled up on the legs of John Wall and Bradley Beal, the Celtics took advantage. Boston broke a 76-76 tie with an 11-0 run that the Wizards never fully fought back. Wall missed his final 10 shots of the night, several of them spot-up threes without a single pass on the possession. Beal did everything he could to keep the Wizards in the game, finishing with a game-high 38 points, but in the end there just wasn’t enough left in the tank. “We just kind of outlasted them,” Olynyk told David Aldridge in the televised postgame interview, a statement that really said it all. 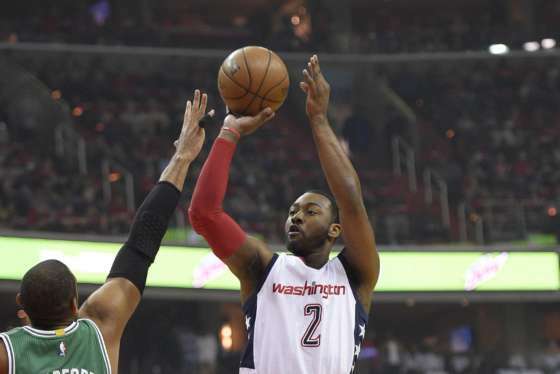 The Washington Wizards are taking on the Boston Celtics in the Eastern Conference Semifinals. Follow along as the Wizards continue their journey in the 2017 NBA playoffs. Olynyk’s open shots came late, when the defensive rotations started breaking down, when tired legs backpedaled into the paint without following shooters back out to the three-point line. His run started on a wide open 18-footer from the right elbow. Then he hit an uncontested three. Sure, he added a couple plays at the rim, but all of it happened as the Washington defense started dragging down the stretch. Over a span of nearly four minutes in the middle of the fourth quarter, Olynyk outscored the Wizards on his own 12-8 (with Beal netting all eight points for Washington). Sitting on a playoff career high of 14 points coming into Monday night, he scored 26 on just 14 shots in 28 minutes of play. That it was Olynyk who fired the final daggers into the Wizards churned up the kind of vomitous reaction of Washington elimination games of the past. A host of unlikely villains have stepped in to end D.C. sports teams’ seasons over the years, and Olynyk solidified his place in that sordid history Monday night. After the epic Game 6 finish and a hard fought first three quarters, it didn’t seem like there would be any reason for the Wizards not to hold their heads up high. But after an overachieving season, they still won’t get their shot at the Cavs, and still face the same questions of depth that have dogged them all year, without a ton of salary cap space to address them. There’s reason to hope for better from this team in the future, but Monday night felt like another predictably unfolding sequel, the plot points recitable from memory, the disappointing conclusion inevitable.